Reservations must be made over the phone or in person. To confirm a reservation it can be held with a credit card or send a deposit to hold each site. Campers must stop at the office and check in upon entering the park. This includes those who have paid in full prior to arriving, those owing a balance, and visitors to the park. Check-In Time: 2:00p.m. * Late arrivals/extended stays will be considered if prior arrangements are made. Please, no check-ins after 9:00 p.m. Guest Pass: Registered campers must check with office before guest arrives. Guest Pass, $5.00 per person and $5 per vehicle. Day visitors must check in at the office and receive a “Day Pass”. Visitors must leave the park by 9:00 p.m. Speed Limit is 5 mph throughout the park. Use 4WD/AWD when traversing inclined roads. Quiet Hours are from 10 p.m. to 7 a.m. Please make sure your dog, audio, video, vocal or instrumental entertainment does not disturb other campers. We are excited to host you, your children, and your pets! While staying here at Timberlake, we ask that they be supervised at all times; Dogs must be kept on a leash at all times and are not permitted in any of the buildings. Please do not attach tethers to trees/ bushes, electric/water pedestals or picnic tables. We ask that you pick up after your pet, so please use the pet area provided for your dogs. If you have more than 1 dog there will be a $3.00 per day per pet charge. For their safety, children under 13 must be accompanied to the showers and restrooms by an adult. Always use caution and care appropriate to our natural settings. We ask that you please carry a flashlight or lantern after dark, children are not allowed to be alone after dark without adult supervision. Smoking is not allowed in any of the buildings and cigarette butts need to be deposited in the proper containers. Campfires are allowed in fire rings only; moving of the fire rings is strictly prohibited. We offer clean bundles of fire wood for sale; if you bring “clean” wood from home it may be used. Gathering wood from the campground or surrounding area is not permitted. Please do not burn garbage in your camp fire. No off road vehicles (ATV’s, quads, and motor bikes) can be ridden in, or to and from the campground. The use of “Firearms and Fireworks” is not allowed in the park at any time. Do not place BBQ’s or anything “HOT” on picnic tables. Please place all trash in the dumpsters located through out the park. Tent campers, for your convenience we have out door sinks provided. Please no dishwashing in the restrooms. 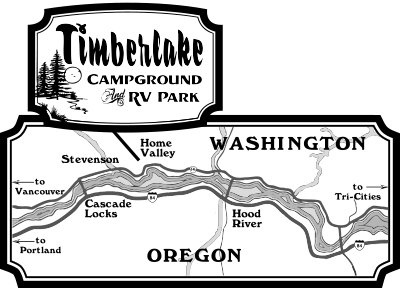 Responsibility for any damage to Timberlake Property by campers or their guests will be charged to the camper. Management reserves the right to require any guest to vacate the park for any behavior that disturbs other guests. Lastly, enjoy the park!!! We take great pride in offering a clean, serene and safe environment for you, your families, and your pets! Thank you for respecting Timberlake Campground and all other guests we look forward to hosting you. Any questions please feel free to give us a call or check with the office. Directions from Home Valley, Washington: Take Berge Road for 2.7 miles, then follow signs to Bylin Road. © 2006 — [wpsos_year], Timberlake Campground and RV Park. All rights reserved.